More than just a music festival, Ravinia is a music experience that has layers of history and significance. The layout of the festival in picturesque 36-acre Highland Park, alongside a vast and varied concert schedule, and wonderful setting arrangements has appealed to the masses for over 100 years. Ravinia, having first taken place in 1905, happens to be the oldest running music festival in North America and is also one of the most diverse in terms of genres. Every year, over 500,000 people visit to see the 120-150 events scheduled at Ravinia. 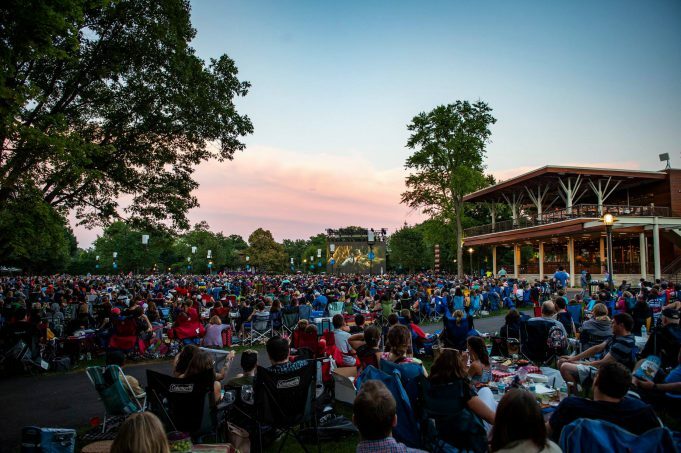 Though Ravinia is the summer home of America’s best orchestra, the Chicago Symphony Orchestra (CSO), past performance line-ups have also included names like OneRepublic, John Mellencamp, Santana, Pentatonix, and many more. Should you decide to skip the music one evening, there are also lawn screenings, live dance performances, and movies. There are 3 performance venues designated for Ravinia, including the 3,400 seat venue known as the Pavilion where the CSO performances take place; the 850-seat indoor hall known as Martin Theatre; and the Bennett Gordon Hall, which can accommodate up to 450 people. Lawn seating is also available on a first come, first serve basis. Guests are permitted to bring a number of items, including blankets, chairs, tables, candles, and food and drink (including alcohol). There are some prohibited items as well, so please be sure to double check on the official Ravinia website. Do note, however, that Ravinia is a smoke-free venue. Should you not wish to bring your own food and drink, there’s a number of wonderful dining options available to you. For 2018, the Dining Pavilion has been completely renovated and now includes two new restaurants. The two sit-down dining options are Tree Top and Lawn Bar. Tree Top has a menu that features international cuisine and uses locally grown produce. Meanwhile, the Lawn Bar provides two full-service bars, one indoor and the other outdoor, as well as small snacking plates and entrées. Aside from sit-down restaurants, there is Ravinia Market for grab-and-go options like pizza, burgers, tacos, and paninis. Lastly, visitors can purchase goods from fanfare carts. Surrounding Highland Park is also a number of grocery stores and restaurants that provide ready-to-eat Ravinia picnic boxes. Donors also have the option of dinner in the Freehling Room, a premier dining club. Being that Ravinia is an experience, it wouldn’t be complete without comfortable lodgings nearby. There are several choice hotels around Highland Park that combine amenities with convenience, such as the Renaissance Chicago North Shore Hotel, which is closest to the Ravinia Music Festival; the Hilton Chicago/Northbrook, a premier hotel with 248 guestrooms; and other local options such as the Four Seasons Hotel Chicago, Hyatt Deerfield, and the Deerfield Residence Inn. The last three around about 10-20 minutes away from the park. Of course, Chicago also offers a number of hostels, Airbnb, and other types of lodging that suit your travel preferences and budget. The amazing Ravinia Music Festival is a once-in-a-lifetime event that happens every year. With a constantly changing line-up, events, incredible food, and a beautiful environment, you will want to keep coming back with friends and family time and again.